THE STORY - Lexington, Kentucky, 2004: Spencer and Warren dream of remarkable lives beyond their middle-class suburban existence. They head off to colleges in the same town, haunted by the fear they may never be special in any way. Spencer is given a tour of his school’s incredibly valuable rare book collection and describes it all to Warren. Suddenly, it hits them—they could pull off one of the most audacious art thefts in recent history, from the university’s special collections library. Convinced they can get away with it, they recruit two other friends. Suddenly, the dance of knowing what happens if they cross the line becomes all-consuming. THE GOOD - Intense performances, smooth editing, flashy visuals and a cautionary tale to young men everywhere. ​​​​There’s a funny thing that happens when you enter from boyhood into manhood. Some may call it a quarter-life crisis, others may say it’s the phase of discovering one’s own path in life. When you have an entire generation of millennial growing up and being told by both society and their parents that they are destined to be great, to be something special and then this phase occurs and suddenly it dawns on you, that all of those hopes and dreams you had are suddenly not obtainable, reality kicks in. For four young college students in the state of Kentucky in 2003, that reality manifested itself into an impulsive, totally unbelievable and selfish idea. They would pull off a heist from their own college, stealing rare and valuable books from the library that would hopefully get them millions of dollars from a foreign overseas buyer. The title card says that this is not a true story and how could it be? It sounds completely unbelievable. But in the hands of writer/director Bart Layton (“The Imposter”), the title card suddenly changes and we’re told that this indeed a true story and the result is one of the most exciting and intense movies of the year that serves as a cautionary tale for young unfulfilled men everywhere searching for identity and the desire to feel special. 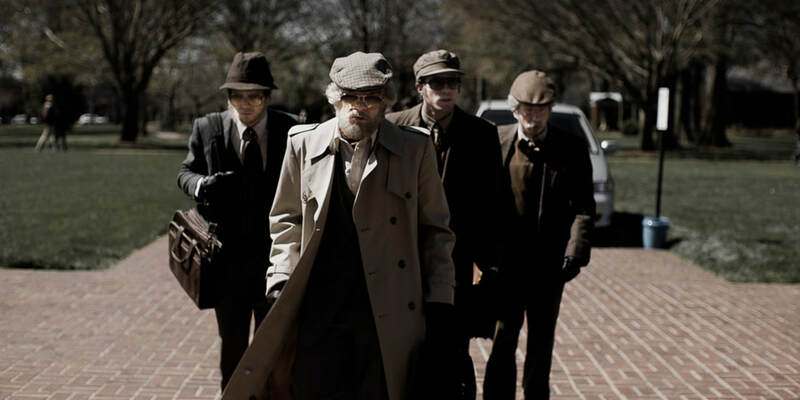 Taking place in Lexington Kentucky over the course of a year from 2003 to 2004, “American Animals” follows Warren Lipka (Evan Peters), Specer Reinhard (Barry Keoghan), Chas Allen (Blake Jenner) and Eric Borsuk (Jared Abrahamson) who all feel their lives are going nowhere as they get closer to the end of their college careers. After going on a tour of school’s library, Spencer comes across a series of rare books of authentic paintings and text written by Charles Darwin himself, the value of which equals roughly $12 million. Spencer presents the idea to his best friend Warren and together the two young men bring on another two friends of theirs to pull off an elaborate heist: incapacitate the librarian (Ann Dowd), steal the books, bring them overseas to a foreign buyer (Udo Kier), get paid and start new lives. Of course, much like the heist films they are inspired by, not everything goes according to plan and suddenly the four young men find themselves in a situation that is way over their heads. From the beginning of the opening credits (Which features paintings of birds and upside down shots of the suburban world that these four young men live in) to the final frame, “American Animals” had me absolutely hooked. Borrowing heavily (And directly referencing) classic heist films of the past, Bart Layton’s narrative feature-length debut is an absolute knockout. Shot with a degree of visual flare, edited to perfection and scored with malice and propulsive energy, “American Animals” is an exciting film that takes you through what is (For better or for worse) the most exciting time in these young men’s lives. It is very much like “I, Tonya” in the way it uses contradictory interview testimony to tell the story from multiple viewpoints. But what makes the documentary-like interviews so fascinating is that they are done by the real-life people who orchestrated and carried out the elaborate heist. What makes this aspect even more impressive is how funny, believable and emotional their performances are. Mostly because, these are not performances. I was fooled into thinking there was absolutely no way that the four men in the present day could possibly be giving such emotional testimony that perfectly fits in with the narrative structure of the film but they do and it helps to make “American Animals” stand out more and feel more unique. But what about the four actors playing the fictional versions of the real boys in flashback? Well, I can confidently tell you that Barry Keoghan, Blake Jenner, Jared Abrahamson and especially Evan Peters are all committed in a way that grips you through the film’s entire runtime. There are times where they are charismatic, insecure, intense, paranoid and yes, they re definitely assholes who did a terrible thing and were way in over their heads. They are four characters who throughout most of the runtime, are very hard to root for. In fact, the film could be criticized for glorifying these four men and asking the audience to take pity on them. Layton finally (At the last minute) correctly steers the ship towards a much more pleasant destination when the real-life librarian gives her interview testimony condemning what the four men did pulling a Marge from “Fargo” on the audience, asking how they could be such animals. “American Animals” has been so far the most energized and dangerous film I have seen at the 2018 Sundance Film Festival. It also happens to be my favorite. It’s a crime film featuring four young boys who want to be professionals but at the end of the day, are clearly not. However, once the snowball starts rolling down the hill, the avalanche comes culminating on the day of the heist itself where the film reaches a whole new level of intensity due to the high dramatic stakes. Bart Layton does an excellent job of putting us in the mindset of these four young men making us feel every emotion they go through on this wild and twisted ride. It’s a place where some may not want to stay very long but due to some creative filmmaking and emotionally charged performances, its endlessly captivating nonetheless.